We ran a webinar with Ceros to show how interactive content generates more leads than traditional lead capture tools. Are you frustrated with the low performance of traditional lead capture tools? We have heard a consistent story from our community of digital agencies- standard lead capture approaches do not work as well as they used to. 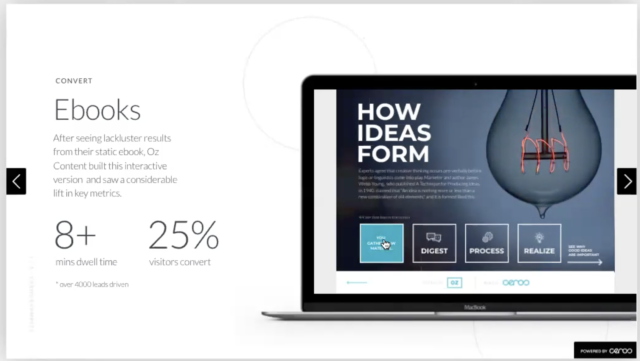 So, we put on a webinar with Ceros, which helps marketers and designers build interactive content. They shared how interactive content creates more compelling experiences for site visitors and ultimately leads to more conversions. Site Engagement: Molly O’Connell, the Agency Program Manager at Ceros, shared how companies can add interactive elements to blog posts to increase reading time on page. One customer, Aon, saw an average of 2 extra minutes of dwell time on a post after adding interactive elements to it. Lead Conversion: Site visitors now see similar Ebooks and infographics over and over again. They need to make a decision on whether they should download your piece of content or the 5 other similar Ebooks that they can easily find. Interactive content allows visitors to immediately begin engaging with the long-form content, and only asks for their email after they have gotten a preview and tracks what interests them. Contrast that with a typical landing page and ebook that requires several often-abandoned steps before the visitor gets what they want, and a pdf with no tracking. Close More Deals: Interactive content can also be used in place of traditional sales proposals. Interactive content makes it more likely that prospects will fully read your proposal. It also shows that you have put a lot of attention into the proposal (even though it still may be based off a template!). You an also track what elements engage them — something you’ll never get from a pdf or powerpoint. Delight Existing Customers: Your social media following sees the same type of posts and imagery throughout their feed. But, if you can include a brief animated preview of your longer-form content, you’ll get more clicks to it. Watch the full hour-long webinar here. Navigate the interactive presentation yourself (built using the Ceros software) here.